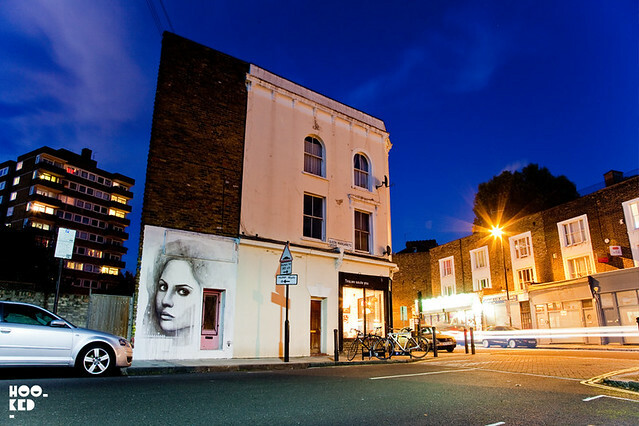 We caught this Ben Slow portrait one evening back in October on the side of the Tina, We salute You coffee house in Dalston. Tina's are into the idea of promoting the local artistic talent they are surrounded by and various artists work has graced their walls since they opened including that of Pochoir and Stinkfish to name a few. “I am always interested in looking for new ways to get my work out there and collaboration has always been something I have always enjoyed. Rather than do it all yourself, I have always been very open to teaming up with others and seeing what can be achieved. Part of the collaboration saw Antique Clothing documenting Ben at work while he was painting the mural at Tina's and have released this short film below, produced for them by Fifth Wall TV. The limited edition T-shirt featuring Ben's work is available to buy online from the Antique Clothing website here.